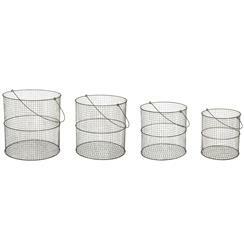 Tall, cylindrical wire baskets provide a pretty place to store anything from fruit to flip-flops. The four silver-finished, metal baskets have handles for easy portability. Group them together for a dramatic display or scatter them around for an artistic accent.